Big Brevard 2015 - Take a Hike! 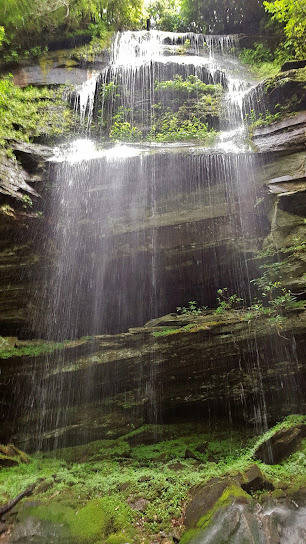 Our annual Big Brevard camping trip was the last weekend in June and as usual, we camped in the very large Kuykendall Group Camp in Pisgah National Forest, just outside Brevard. We left Friday after work and got to Brevard around 730. We stopped for dinner at Hawg Wild BBQ, shortly before Justine and her crew arrived and we were all able to have dinner together. It started raining while we were eating and didn’t let up for most of the night. After dinner, we headed to camp and set up our tent quickly in the rain. It was too rainy for a campfire, so we pretty much went to bed after that. In the morning, the rain died down for a bit and we got ready for our hike. From camp, we got on US-64 west and then took NC-281 north into the Little Canada area. We went over 15 miles and turned right on Charleys Creek Road and parked in under a half-mile along the side of the road. Upper Waterfall on Sol’s Creek is just down below the road at this point, but there’s no trail and it’s a steep bushwhack down to the creek, made worse by the recent rains. Fortunately, a thin stretch of National Forest property allowed us to reach the creek without trespassing on private property. We started off bushwhacking through the woods and soon found a series of ropes tied to trees. These ropes not only assisted with the steep descent but also helped us ensure we were staying on the right path. Once we made it to Sol’s Creek, we just had to follow the creek a short ways upstream to the waterfall. However, there was no trail and the going was slow, especially due to the slippery rocks. Soon, we made it to the scenic 50-foot waterfall. This is a really pretty, though rather unknown waterfall, but we didn’t stay too long for pictures as the rain picked up while we were down here. After a few pictures, we started heading back. The ropes made the climb back up to the road a bit easier and by the time we made it to the cars, the rain had stopped. From here, we turned left back onto NC-281 and went south about 10 miles to Winding Gap Road. After turning left here, almost immediately, we went right at the fork onto a narrow gravel road and drove to the end and parked. From here, we started hiking down the gated road. We crossed a couple streams right at the beginning and then another about a half-mile into the hike. 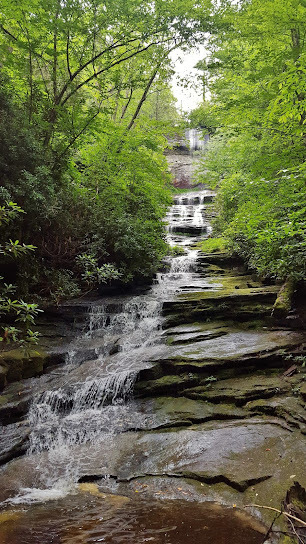 A side path leading up the stream led to Aunt Sally’s Falls, but we decided to save that one until the end. We wanted to get the hard ones out of the way first. Shortly past the turn, we spotted a red eft, the juvenile stage of an eastern newt, right along the trail. We continued to follow the old road for about another half-mile to where it ends at a campsite along West Fork French Broad River. After crossing the river, there wasn’t much of a trail to follow, but there was semblance of a path and the occasional flagging tape. Shortly after crossing, we came to a split and headed right. Almost immediately, we crossed an unnamed tributary of West Fork French Broad River at the base of the lower waterfall on this tributary. There’s a lot of deadfall at this waterfall and I’ve heard it referred to as Treetrunk Falls, though neither the waterfall nor the stream have official names. We got a couple pictures, then crossed the tributary and started working our way upstream. The path was getting steep, but nothing compared to what we could encounter soon. 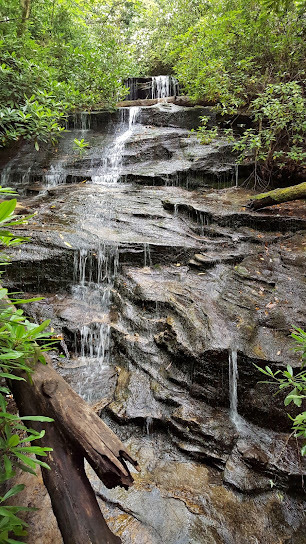 In about a quarter-mile, we came out at the base of Waterfall on Tributary of West Fork French Broad River, also called Rhapsodie Falls. This scenic 70-foot waterfall flows over a cliff face in a thin curtain in a setting reminiscent of a tropical rainforest. It’s a beautiful spot and we stopped here to eat lunch. After lunch, we continued on the path heading south towards the Dismal Creek drainage and soon came to another split and now the trail really got difficult. Going right, we started heading up an extremely steep path. No switchbacks, no resting spots, just straight up. Although it’s probably less than a quarter-mile, it seems much longer. But at least it wasn’t hot – the temperatures were in the low 70s and the occasional rain helped keep us cool. Once we reached the top, we had to make an even steeper descent down to Dismal Creek. Fortunately, some ropes were tied at some of the steepest parts to assist. These were especially important today with the ground being wet. Where there weren’t ropes, we held on to rhododendron branches and “monkey-climbed” down. Finally, we reached the bottom right at the base of beautiful Dismal Falls. Certainly, Dismal refers to the trek to get here, not the spectacular waterfall. The water flow wasn’t as high as the last time we were here, but it was still quite beautiful. This was the last waterfall for Justine to complete the WC100 challenge, so we had to celebrate a bit. We played in the water and got some pictures and just as we were getting ready to head up, it started raining again. As if the climb out of here wasn’t hard enough. I think going up is generally easier than going down, so it wasn’t too bad as the ropes helped pass the slippery spots. I would have preferred the rain to high temperatures anyway. Slowly, we made our way to the top and then started the steep hike down. I find that going sideways helps take some of stress off my knees on such steep descents. When we reached the split, we went right to head to Lower Dismal Falls. Right away, there was a steep part to go down into the gorge, but it was much shorter than the descent to the main waterfall. 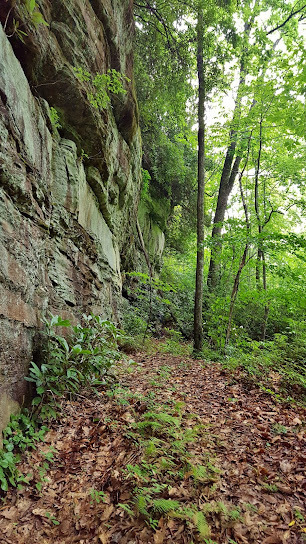 Once down at creek level, we followed Dismal Creek upstream and soon came to a huge rock wall along the gorge. The rock wall was really cool – it would have been worth coming down here just for that. We hiked a ways along the wall and then had to rock hop in the creek up to the base of Lower Dismal Falls. It’s much smaller than its upstream neighbor, but still a very nice waterfall. We got some pictures and then headed back the way we came. As we were heading up the last steep part, we saw another couple coming down. We weren’t expecting to see anyone else here, especially on a rainy day. We chatted with them for a couple minutes and then continued making our way back. Before reaching Rhapsodie Falls, we turned right and headed downstream on the other side of the unnamed tributary, which intersected back near the lower waterfall. We made the detour to Aunt Sally’s Falls on the way back. Once back at the cars, we changed into clean clothes as we were all filthy after the strenuous hike in the rain. We headed into Brevard and had dinner at Twin Dragon China Buffet and then headed back to camp. It had finally stopped raining, so we were able to have a nice campfire Saturday evening. Shortly before sunset, a beautiful rainbow was visible over camp. I don’t think I’ve ever seen such a perfect rainbow! We socialized around the fire for a while and then headed to bed. Sunday morning, we woke up and broke camp. After saying good-bye to all our friends, Sandy and I headed to Gorges State Park. At the visitor center, we turned left and drove to the Bearwallow Falls parking area. After getting ready, we hiked the short Bearwallow Falls Trail to the overlook for the waterfall. Unfortunately, with all the foliage, the view of the waterfall isn’t that great. We saw a faint path heading down past the wooden overlook, so we followed it to try to find a better view. It was quite steep and we had to hold on to rhododendron branches to get down. We came out at a spot at the base of a 15-foot or so cascade over several rock ledges. This part of the waterfall is just below the part we could see from the overlook, but we couldn’t see anything above it. We decided to give up and try again another time. So we headed back to the car and drove to the Rainbow Falls trailhead parking area. We hiked down the trail and of course had to stop at the beautiful Rainbow Falls. A small rainbow was visible right at the base, but it was too late in the day for a better rainbow. We then continued on to our main destination for the day – Turtleback Falls. The water level seemed a little higher than normal, but not too high. I was a little concerned, however, as no one else was sliding off. It seemed like everyone was waiting for someone else to go first. Finally, a teenager defiantly walked over to the rope, climbed up and slid off the waterfall. He ended up getting in trouble and wasn’t allowed to swim anymore, but I was glad someone went first. Seeing that it was safe to walk over to the rope, I waded over and climbed up the waterfall and then slid off. It had been several years since I had the chance and it was a lot of fun. The water was quite cold, but the rush of sliding off a waterfall kept me from noticing at first. After a couple runs, I was starting to really get cold so I got out of the water. Sandy ended up not sliding – she claimed it was too cold for her. So once I was done, we headed back to the car and started making our way home. We stopped at Las Salsas in Morganton for dinner and had a huge portion of fajitas, a fitting end for another epic Big Brevard trip.